Update your interior with the Strada Oak Bar Stool Black, a wonderfully modern design with smart bentwood style. Unique in every way, the Strada is at once sophisticated and comfortable, and is also equipped with a number of practical components. 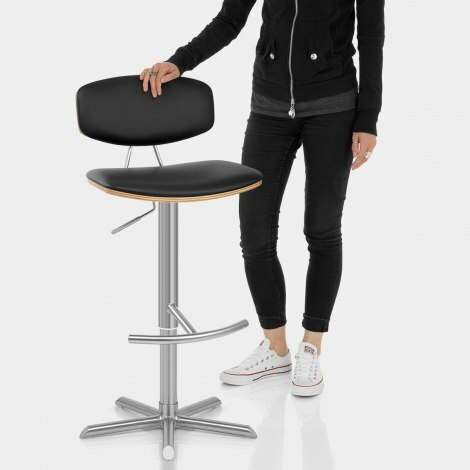 Well padded for excellent comfort, soft black faux leather upholsters the seat and elevated backrest, which is connected by two metal uprights. Complete with a polished oak finish, the seat and backrest are supported by a sleek bentwood shell that contrasts with the frame below. Comprised of a tubular column and a unique five-spoke base, the sturdy metal frame has a brushed steel finish, for a muted modern look. The column incorporates efficient features, including a variable height gas lift mechanism, a 360-degree spin function, and a curved T-bar footrest for ample support. The base has integrated floor guards on the underside, to help protect your surfaces. "Excellent Service, Speedy Delivery - Good value"
Excellent Service, Speedy Delivery - Good value! I have now purchased 4 of these breakfast bar stools. A great buy easy to assemble, look really good. excellent quality. The delivery time was unbelievable.